There are several ways to share files and folders, each with a different application. Although you can share one-off files, most permissions are set on folders, so let's start there. To create a folder, simply click New > Folder, name the Folder, and either keep it private to you, or set who has access (known as a "folder collaborator") by email address. If you're unsure of what level of access they should have, hover over each option to see what they mean. "Editor" is usually a good permission level for anyone reading and writing files with you. Note we've created a private folder and a shared folder. You can tell if a folder is private or shared by looking at its folder icon - if it has the blue icon of people on it, it's shared. The yellow folder icon indicates the folder is Private to you. 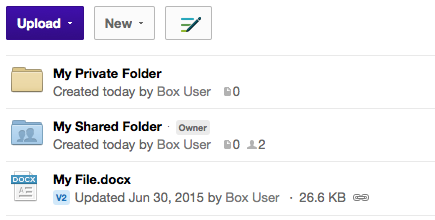 Notice also that the Shared folder has the "Owner" icon next to it, designating that you're the Owner. There is only one Owner per shared folder, and only the Owner (or an IT administrator) can transfer Ownership to someone else. 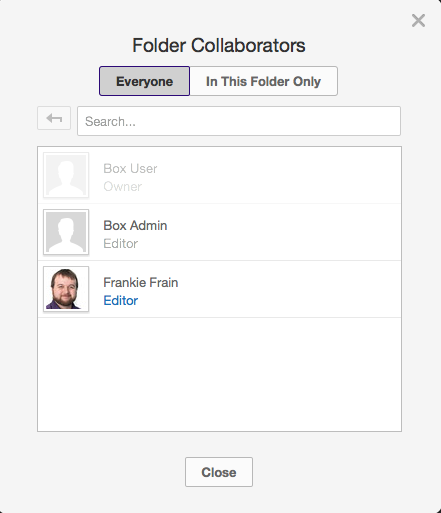 If we'd like to add more collaborators to the folder, right click the shared folder and click "Invite Collaborators." Simply invite more people by email address. 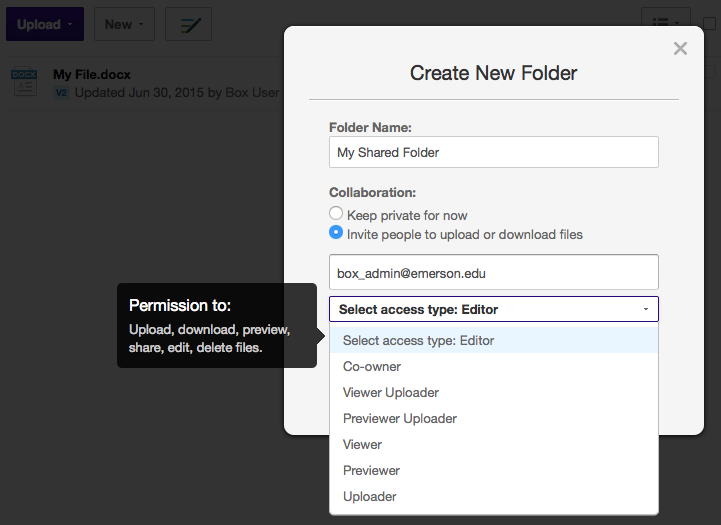 If we'd like to remove someone's access or change their access level, right click the shared folder and go to Properties > Collaborators. To change their access level, click their access level link (in the screenshot, "Editor") and change to another option. To remove them from the folder outright, click Remove. Let's say we want to create a subfolder inside of "My Shared Folder." 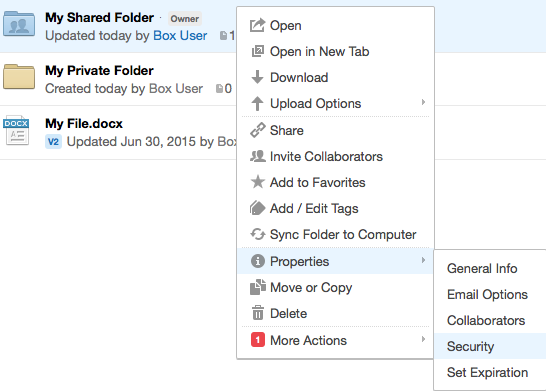 Simply go inside "My Shared Folder" and create a new folder, just as we did before. The permissions on the subfolder will match exactly what you set on the top level (or "parent") folder. 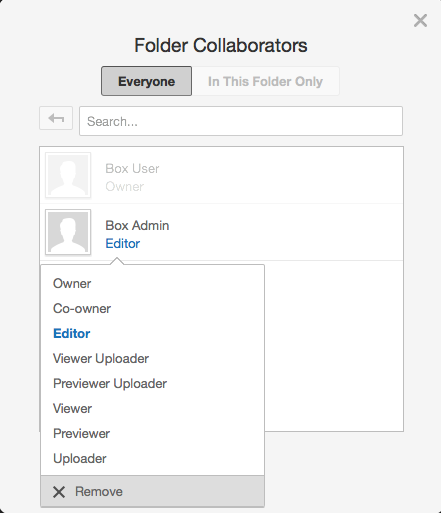 If you want to add more users to the subfolder, simply right click the folder and Invite Collaborators. You cannot, however, remove anyone from a subfolder who had permission to the parent folder. 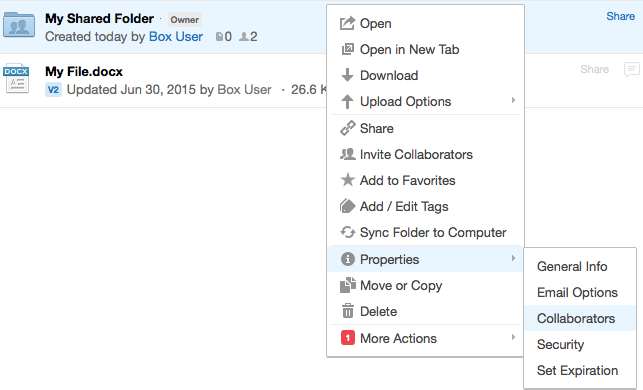 Notice that "Box Admin," to whom we granted rights to "My Shared Folder," has the "Editor" link grayed out. But "Frankie Frain," a user we added to "Subfolder," can be removed. For this reason, subfolders should not be used as a way to restrict access, but rather to open them to more users. 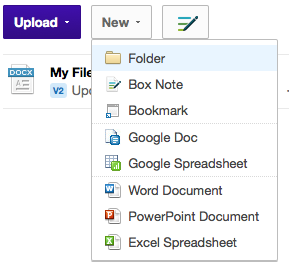 If you need to create a more restrictive folder, you should create it at the top level of your account. Let's look at more advanced permissions. Right click your shared folder, and go to Properties > Security. 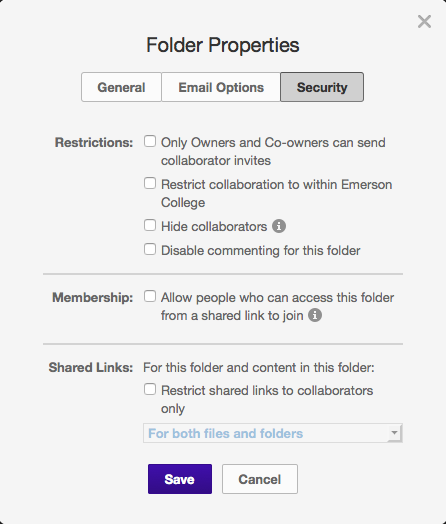 The first option, Only Owners and Co-owners can send collaborator invites, restricts people who have lower level access on the folder from being able to share it with more people. If you're concerned about the security of the folder, this is a good measure, because it allows you to limit exactly who does and doesn't get to add more people to the folder. The second option, Restrict collaboration to within Emerson College, restricts anyone from being able to invite external collaborators (Box users who don't have emerson.edu email addresses, like outside contractors or friends). If this is not checked, you're welcome to send collaboration invites to any email address in the world. 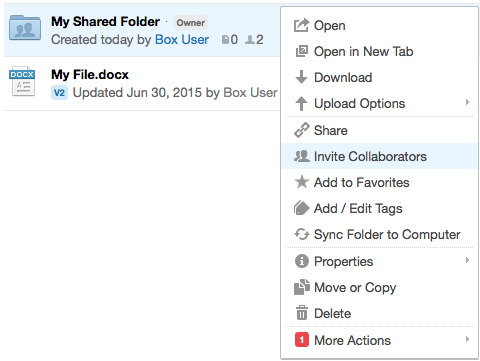 The third option, Hide Collaborators, disallows your collaborators from seeing who else the folder is shared with. Notice there are a number of options regarding "Shared Links," which we'll get into more deeply in a moment, but shared links, as we saw in Box for Office, allow users to share a folder or file via a URL. 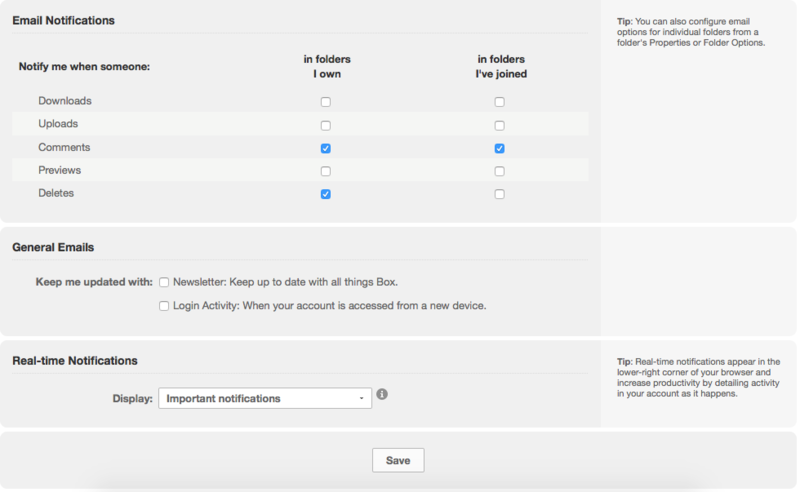 Click "Email Options" to review a few more sharing features. 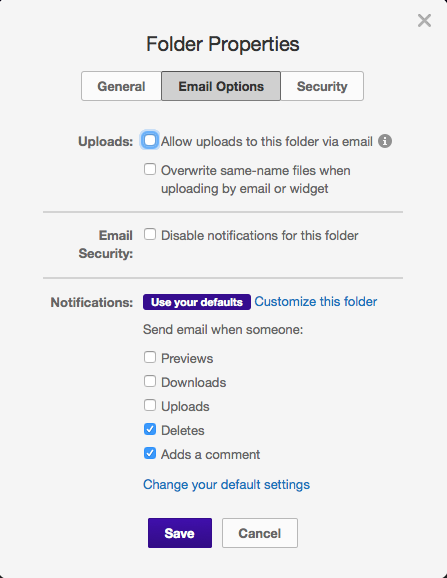 The first option, Allow uploads to this folder via email, would assign an email address to the folder and allow users to add files simply by emailing that address with attachments. If you check the box, it will present you the email address, and give you the option to restrict email uploads to collaborators only. You may also want to check the "Overwrite same-name files" option, so that you can overwrite something you've uploaded by emailing the address. Moving down the options further, you can set when you'd like for you and your collaborators to receive email notifications for certain kinds of events in the folder. 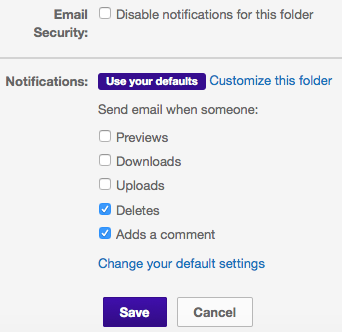 IT has set default behavior for all users (to only notify collaborators when someone adds a comment or deletes a file), but that can be over-ridden for this one folder, or the default behavior for all new folders you create. You can even disable all notifications outright. To change your Default notification settings, click "Change your default settings" and modify them however you'd like. What if you'd like to just share one file? When right-clicking the file, you'll notice that most of the security options, such as "Invite Collaborators," "Security," and "Email options," aren't present. When right-clicking, you will, however, see an option called "Share," which brings you to the same options as hovering over the "Share" link on the file. Box will create a custom URL for you, and when you email or share that link, the person will be able to preview the file in browser. We do not currently allow users to download a file from a shared link. But you can also set a much more memorable and easier to share custom link. 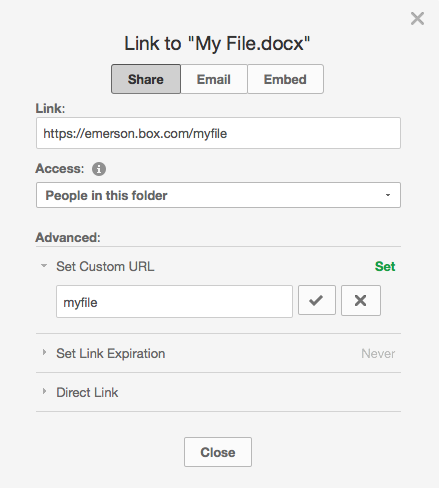 Note, here we set the custom link to "myfile," so the full URL becomes "https://emerson.box.com/myfile." Whenever sharing, you should always consider security, so you may want to consider forcing the link to expire by a certain date. Maybe you want someone to be able to preview a file for a few days, and then never again. Simply set a date under "Set Link Expiration." 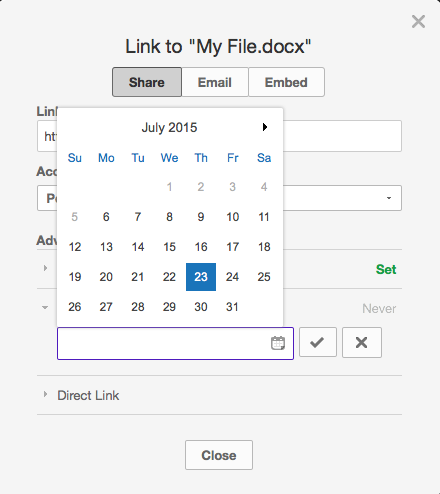 Now, notice your file has been marked by the link icon to indicate it's shared, with a reminder as to when the link will expire. Important note: When you create a folder, you're the folder Owner - any files you store there, whether by you or by your collaborators, will count against your 25GB quota. There are even more nuanced methods for file and folder sharing, but that should be plenty of information to allow you to share easily and securely!